Shop Urban Gardening for smaller greenhouse gardening needs. 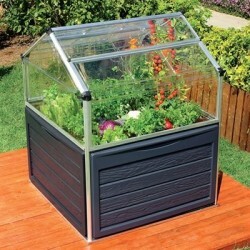 These miniature greenhouses are great for small patios or porches of apartments and condos. Free Shipping on all orders! Take your patio garden to a whole new level. The Plant Inn is the perfect product for growing in small spaces and raised beds make gardening accessible to everyone.